“Includes chickens, ducks, turkeys, geese and quail” – Signed by the author! A book is in some ways a reflection of its authors and this one is no exception. Cara Harrison keeps her hens, ducks and quail in a small urban back garden while her father, John, has a smallholding in Wales after many years of suburban living and keeping an allotment. This simple, straightforward guide, written in plain English with black and white illustrations and photos, is not designed for the coffee table. It’s a manual to help those keeping chickens and other poultry. What about the dog? And the children. All about eggs and how to market your eggs, store your eggs and use them plus eggonomics – selling your surplus eggs, the pounds and pennies of chicken keeping. The pros and cons of raising table birds. Is it really for you? 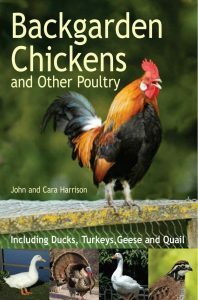 John Harrison’s latest volume, written in collaboration with his daughter, covers all the basics of keeping backyard chickens and other poultry. It will give all the information needed to someone researching the subject before they embark on this endearing hobby and will stand as a useful reference title to those new to it and those more experienced alike. As head gardener to Woodside Lodge Hotel in the New Forest & a horticultural lecturer I am often asked for my opinion on the many books out there & just how helpful they can be. We have recently embarked on a project to provide our own free range eggs to hotel guests along with the organic vegetables from the walled gardens. I was recommended to read The book on ‘Backyard Chickens’ by John Harrison & his daughter. As well as being a really good read it has all the information one needs to get you started on the road to successful chicken keeping. I can only echo the other reviews, it scores top marks for value & content. A real diamond in the rough. This is a superb book for nayone starting off in both gardening and trying to be eco friendly. Maybe you don’t want to go all the way, however, this is certainly a good start. I found this book to be a very useful guide, loaned it to a colleague who is also interested in keeping hens, who now tells me he has ordered his own copy.